After a mediocre 2007 season at AAA, the Twins weren’t convinced that Denard Span was the man to take the reigns from Torii Hunter in center. The phrase “playing angry” has been used to describe Span’s mentality since then. And if that’s what it takes to motivate him – it seems to have worked. When Michael Cuddyer had an injury-plagued season in 2008, Span got the chance to show his mettle. He played in 93 games, hit .296, and wound up sixth in Rookie of the Year considerations. 2009 saw the emergence of Span as one of the League’s best lead-off hitters - posting a .311/.392/.807 line while displaying patience at the plate and hitting lefties about as well as righties. While juggling all three outfield positions in 2009, he found a home at the top of the Twins lineup. The offseason trade of the excitable and erratic Carlos Gomez for the Brewers’ J.J. Hardy has made room for Span to claim center field as his own - where you will find him at least until the 2014 season thanks to the new 5 year deal worth $16.5 million – with a $9 million option for the 2015 season. Locking up the 26 year old Span follows a strategy of signing younger players prior to arbitration and free agency. The same was done with pitchers Scott Baker and Nick Blackburn. Don’t be surprised to see a similar deal made in the near future with Kevin Slowey – now that it appears he has recovered from a season-ending wrist injury in ‘08. These contracts are a win-win for the front office and players. They secure rising talent at a reasonable rate and offer stability to players who know that one injury or bad season could lessen their market value. This season Span will be faced with the new challenge of being the everyday center fielder. Losing Gomez sacrifices mobility and range in the outfield. But knowing Span’s track record, telling him Gomez’s defense will be missed is probably the best thing that could be done to motivate Span. We have yet to see the extent of his defensive capabilities. He is off to a great start this spring, hitting over .500 in his first 6 games - that following the .331 mark he posted in the second half last season. If he keeps up that pace he may even find himself a spot on an all-star roster in the near future. How about that idea, an all-star center fielder for the Minnesota Twins? Sound familiar? With his hard work and dedication, Span has become one of the most liked and well-rounded players on the Twins roster. 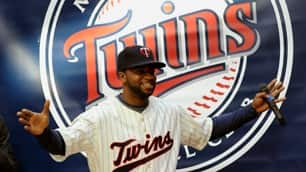 Twins center fielder Denard Span debuts the new/retro alternative home uniform for 2010. I do like the proactive approach the Twins front office has taken to locking up its young talent; we're able to take advantage of their prime seasons without having to break the bank. I hope this is a trend that continues with other valuable pieces such as Slowey (as you mentioned).